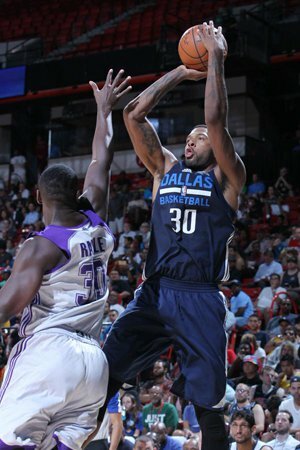 Jeremy Tyler, Dallas: While his play here is not necessarily going to be full consolation for the whole DeAndre Jordan situation, it seems to be a nice sign for Dallas to reap some Summer League rewards. Tyler was a man amongst boys at times during the Mavs SL play-off against the Lakers, looking to be in good condition and showing his pro experience. He finished with 25 points on 11-15 FG (3-3 FT) and 11 rebounds, not to mention the eventual winner to give Dallas the 88-86 win. He was not bothered by Tarik Black’s physicality, at one point converting a beautiful spin-move into an and-one dunk. With a nice touch, Tyler really is showing his talent here and with Dallas scrambling at center, they may have at least one solution for a roster spot. Mike Muscala, Atlanta: It is no surprise that Mike Muscala shoots the ball quite well off of the catch or given an opening. The surprise is more in the toughness and versatility he showed in a win over Miami, as he finished with 15 points, 12 rebounds and 5 assists. Not to mention, he had a serious head on collision going after a ball with the scorers table, got up and played on like it was nothing. Muscala seems like he could carve a niche in Atlanta if he gives the same effort in practice that he gave in their first-round SL match-up. DAngelo Russell, LA Lakers: No one should be writing a player off during Summer League and that is not what we are doing here. It just has been a rather disappointing start for a player that many deemed to have star potential out of the gate. Russell is not fully to blame, as their seems to be no team that has had worse positioning offensively in Vegas than the Lakers, with Russell being a lone player finding decent spots on the floor. He also had a few drives and passes that were quite impressive. The end result was still, unfortunately, a game where he finished with single digits (8 points on 3-11 FG/0-5 3PT) in 34 minutes. It has been a lot more difficult for him to create his shot, and while he did finish with 5 assists, he needs to get to know his personnel better. That should come with time, it just did not come as quickly as some had hoped. James Michael McAdoo, Golden State: McAdoo has imposed his will during Vegas Summer League and had his best game so far in a 83-67 drubbing of the Sacramento Kings. He finished with 20, 9 rebounds and 3 assists, running well plus using his athleticism to his advantage. He seems to be a lot more seasoned and could fill an energy role off of the bench. Still does not get too much facing up, but he has impressed with the improvement and assertiveness he has shown here. Karl Anthony Towns, Minnesota: The Timberwolves may not have come away with the W in their match-up with Portland, but they had to have felt great about the way Towns played. He was absolutely one of the top performers yesterday and showed the vast array of skills that made him the #1 pick. Whether it was in the post, facing-up or passing out of the double team, Towns seemed comfortable and even dominant at times. He finished with 20 points (7-9 FG, 6-6 FT), 10 rebounds, 2 assists/steals and 3 blocked shots in 36 minutes. Easily his best game thus far and something that gives Timberwolves nation a great deal of hope. Willie Cauley Stein, Sacramento: He brings a lot of energy and his potential as a defender is intriguing. Even so, with the way the players taken after him in the top 10 have been looking, it has to be a wonder as to whether this was the right choice for the Kings. Cauley-Stein finished with 6 points, 4 rebounds and 3 blocks in 20 minutes in a 83-67 loss to Golden State. Trey Lyles, Utah: Another rough shooting day for Lyles, as he finished with 7 points on only 3-11 FG (1-4 3PT). It has been tough for him to get to good spots and his shot selection is still quite spotty. It would definitely be better for him to have gotten the chance to play with Rodney Hood or Dante Exum, though you might expect Trey to step up a bit in their absence. It seems that he is not ready at this time to do that and will need to be brought along slowly, which is most likely the plan with the Jazz. Rashad Vaughn, Milwaukee: Even if he did go to Findlay Prep and UNLV, his play here has still generated buzz amongst people who may not make that connection. While his percentages have not been fantastic, he seems to be gaining confidence and poise by the game. He finished with 23 points in the Bucks 97-93 win over Houston, while hitting 3-6 3 PT and going 6-8 from the line. For someone who does not turn 19 until next month, he has looked very poised and has an advanced body for a SG. Justin Anderson, Dallas: He cooled off in the 2nd half, though was absolutely on fire to start the game. He finished with 16 points and an impressive 4-7 from 3, also finishing a break with a thunderous dunk. He is really left hand dominant, but his physical and athletic tools make him quite ready to enter training camp and compete like a seasoned veteran. Bobby Portis, Chicago: Bulls fans here have been really excited about Portis, as he brings a high level of activity along with some skills that make him a face-up threat. He finished with 16 points and 10 rebounds in the Bulls 91-73 takedown of the Cleveland Cavaliers. Rondae Hollis Jefferson, Brooklyn: He is a fantastic athlete and gives great effort on defense, but his shot is still flat out ugly. He settled for numerous midrange jumpers that showed the major hitch and ultimately, did not drop. He finished with only 2 points on 1-6 shooting, with 6 turnovers in 24 minutes. On the plus side, he did have a couple spectacular blocks. Both Jahlil Okafor and Justise Winslow did not play in their play-off games. Word is that Justise has a minor injury and might be done, with Okafor more than likely just sitting out after playing in both Utah and Las Vegas. Sean Kilpatrick scored 26 points in Milwaukee’s win over Houston, joining Rashad Vaughn and Kevin Jones in the 20 point club in the game. Kilpatrick is off to yet another really strong Summer League, combining strength with an adept shooting touch. Shabazz Napier was quite active during Miami’s loss to Atlanta, finishing with 21 points. Even so, he finished with 2 assists to 7 turnovers. Walter Tavares and Gabriel Olaseni was one of the more fun match-ups to watch on the day. “Edy” Tavares is just an absolutely massive human being, showing some decent hands and giving a strong effort running the court (even though he is not the most fleet of foot). He is still quite raw, having only started playing at 17-years of age, but he is a presence defensively. He finished with 10 points, 7 rebounds and 5 blocks. Olaseni is also rather raw, though he runs the floor nicely and finished with 13 points. Markel Brown had his best game of Summer League up to this point, finishing with 23 points and 4 assists against Philadelphia. Dallas may have one of the most balanced front courts in Las Vegas, with Dwight Powell joining the aforementioned Jeremy Tyler and Justin Anderson. Powell is a fantastic athlete whose toughness has been questioned at times. He ha provided some versatility here and pitched in on the boards. He finished with 12 points, 9 rebounds and 4 assists on Wednesday. The Lakers definitely gave a valiant effort against Dallas, even with a lack of ball movement on the whole. Jabari Brownscored 19 points, while Jordan Clarkson added 17 and Julius Randle matched that total in his best early game of Summer League. Seems that Randle needs to do a bit to get back into top playing condition, though he still has that strength and athleticism to give him a chance to be quite productive, even knocking down a couple step back jumpers. Doug McDermott continued his strong Vegas Summer League showing for the Bulls, finishing with 16 points, 5 rebounds and 2 assists. Should be much more ready to contribute for new coach Fred Hoiberg in Chicago. Noah Vonleh also kept things going well in his first summer in a Blazers uniform, as he battled Karl-Anthony Towns with 16 points and 10 rebounds of his own. Vonleh’s work on the offensive glass should at least get him a bit more time on the court for the rebuilding Blazers, as opposed to his limited role in Charlotte. Other players of note for Portland have been Tim Frazier, who has been running the team at a high level and Malcolm Thomas, giving some great energy and providing a strong contribution off the bench. One of the players the Blazers might need to lean on quite a bit more this season, Allen Crabbe, was carried off the floor on a stretcher pretty early into the game against Minnesota. X-Rays came back negative and it seems to be a lower leg injury, which will likely put an end to his time in Summer League.